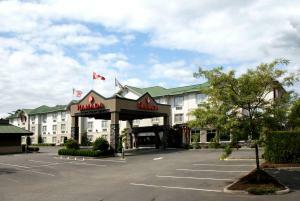 Ramada Surrey/Langley is located on Highway 10 at 192nd Street. 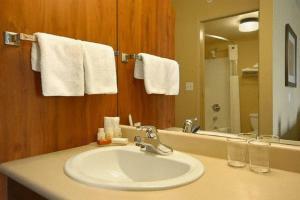 This hotel is located in Surrey BC close to the border of Langley and within minutes of Cloverdale rodeo grounds. 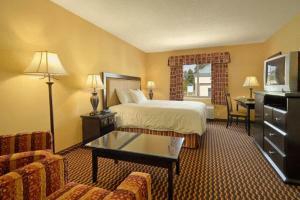 Ramada Surrey/Langley is close to Cloverdale, Surrey, Langley, White Rock and minutes from the Canada/US Border. 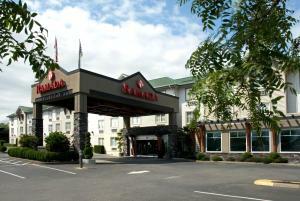 This Ramada hotel is 40 km/25 miles from Vancouver International Airport, 27 km/16 miles from Abbotsford International Airport and 58 km/36 miles from downtown Vancouver. 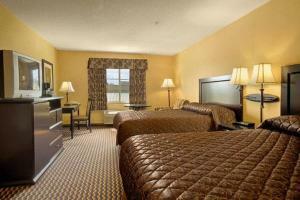 Make the Ramada Surrey/Langley your home away from home while you enjoy your holiday in the Fraser Valley. Visit one of the many wineries in the area – Domaine de Chaberton, The Fort Wine Company, Towneship 7 Vineyards and Winery, Rivers Bend Winery and Vista DOro Winery. Let us be your choice for accommodation for all your sporting events in the local area – Twin Rinks, Langley Events Centre, Cloverdale Fairgrounds, Cloverdale Athlete Park, South Surrey Arena, South Surrey Recreation Centre, Surrey Sport and Leisure Complex, Newton Athlete Park and Softball City. Voted the Best of the Best Hotels in 2009 by Langley Advance we invite you to Stay and Play – Northview Golf and Country Club, Eaglequest Coyote Creek Golf Course, Belmont Golf Course and Morgan Creek Golf Course are all nearby. This 100 percent non-smoking Ramada hotel offers an indoor pool, hot tub, fitness centre, free continental breakfast, business centre, meeting room, complimentary wireless high speed internet free local calls. ABC Family Restaurant is located adjacent to the hotel and is open for breakfast lunch and dinner. Free parking is available on site. Ramada Surrey/Langley has completed an extensive renovation to all guest rooms, lobby, breakfast room and meeting space and looks forward to welcoming you. Pets Allowed – 15.00 per pet per night. Maximum 2 pets-Small/Medium Dogs Only. Pet Room requests MUST be booked directly with the property..
Pet Sitting / Dog Walking in Surrey, British Columbia. If you are the owner of a Pet Sitting or a Dog Walking business in Surrey, British Columbia and wish to add your business listing free of charge to this city please submit your info here. Handicapped Rooms & Facilities; Meeting/Banquet Facilities, Corral Room; Non Smoking Rooms/Facilities; Pet Allowed $10 Cdn per pet per night; Indoor Pool; Restaurant; Fitness Center 7am – 11pm or Spa; Clock Radio; Work desk; Coffee Maker; Hairdryer; Iron/Ironing Board; Television with Cable; Free Continental Breakfast served 6:30am to 9:30am weekdays and 7am to 10am weekends; Free Newspaper; Free Parking; RV or Truck Parking; Free high-speed internet; Free Local Calls; Dataports; Voicemail; Full Service Restaurant adjacent to to building; ABC Family Restaurant; Kitchen units with microwave oven and refrigerators. Self-Serve laundry. Additional Pet Policies: Guests are encouraged not to leave their pets unattended in rooms. Cancellation Policy: Cancellations must be received 24 hours before date of reservation, or guest will be charged first night accommodation.